Partly cloudy skies early. Thunderstorms developing late. Low 67F. Winds SSE at 10 to 15 mph. Chance of rain 90%.. Partly cloudy skies early. Thunderstorms developing late. Low 67F. Winds SSE at 10 to 15 mph. Chance of rain 90%. Brusly's Myla Edwards competes in the triple jump during the Westside Relays last week in Port Allen. Port Allen's Rickia Lenoir prepares to throw the shot put. The Brusly Lady Panther track program’s Class 3A state title win in 2017 only left the coach ready for another one, and they got a good start on that quest last week. BHS nudged out Port Allen in a fierce battle last week at the annual Westside Relays at Guy Otwell Stadium, on the campus of Port Allen High School. The Lady Panthers and Lady Pelicans put forth a dazzling effort that ended with a 137-point finish for BHS and 113 for PAHS. Dunham placed third (76), followed by Northeast (71), Central (48), Catholic-Pointe Coupee (33), Avoyelles (30) and Thrive Academy (10). Brusly claimed the top spot with wins in four running events and three field categories. PAHS got most of its mileage off with the top spot in three field competitions and one relay victory. Ta’La Spates led the pack for Brusly in the 200-meter run (24.53), while Mackenzie Jenkins topped the competition in the 400 (1:01.00) and Leah Dupre took first in the 100-meter hurdles (17:00). The tandem of Myla Edwards, Megan Williams, Dupre and Chantell Betz notched first in the 4-by-100 meter relay. In field events, Hannah Pedigo had a 10-0 height for first in the pole vault event, while Jayshyree Bell leaped 14-0 for the top prize in the long jump and Edwards got the blue ribbon for her 35-03.25 showing in the triple jump. 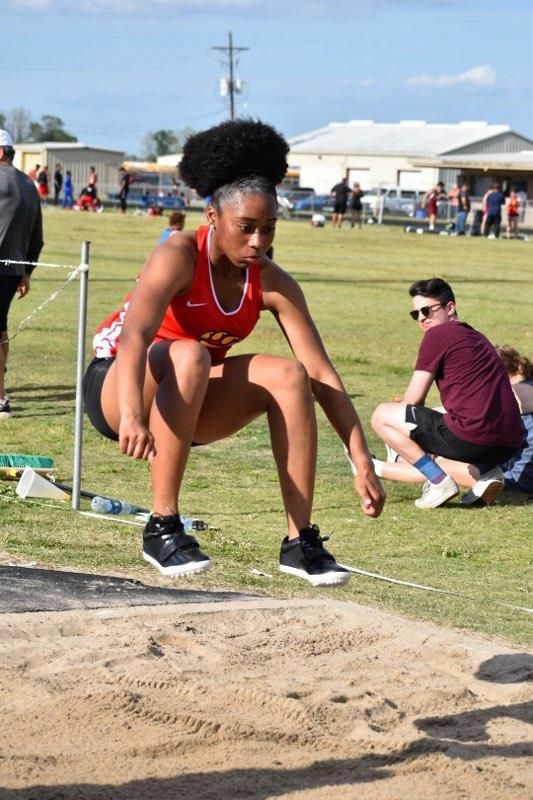 Port Allen continued its strong showing in field events when Emily Nichols aced the discus competition (121-09) and Tiara Jones led in the Javelin (92-05). The Lady Pelicans took first in the 4x200-meter relays off the showing by Jasmine Butler, Tremecia Moore, Alyssa Miller and Christy Wicker. PAHS took second in the 4x100 with Moore, Miller, Wicker and Raven Murphy. Team Scores: 1. Brusly, 137. 2. Port Allen, 113. 3. Dunham, 76. 4. Northeast, 71. 5. Central, 48. 6. Catholic-Pointe Coupee, 33. 7. Avoyelles, 30. 8. Thrive Academy, 10. Discus: 1. Emily Nichols, Port Allen, 121-09. 2. Olivia Beauvais, Catholic-PC, 92-4. 3. Rickia Lenoir, Port Allen, 80-2. Javelin: 1. Tiara Jones, Port Allen, 92-05. 2. Michaela Fennell, Dunham, 89-04. 3. Karla Kimber, Port Allen, 86-05.